Have you heard of the Romorantin grape? It’s a white grape that has been grown in the Loire Valley since the 16th century. It makes a crisp wine that has great minerality and acidity. DNA profiling has determined it to be the offspring of Pinot Meunier (of Champagne fame) and Gouais Blanc (an ancient white grape rarely grown today). The Cour-Cheverny appellation is situated within the larger Cheverny appellation, which is the most important zone in the middle Loire. It was promoted to full Appellation Controlee status in 1993. The wines made from Romorantin make up its own appellation (Cour-Cheverny) which is only about 48 hectare. I’ve had wine from the Romorantin grape a few times now. 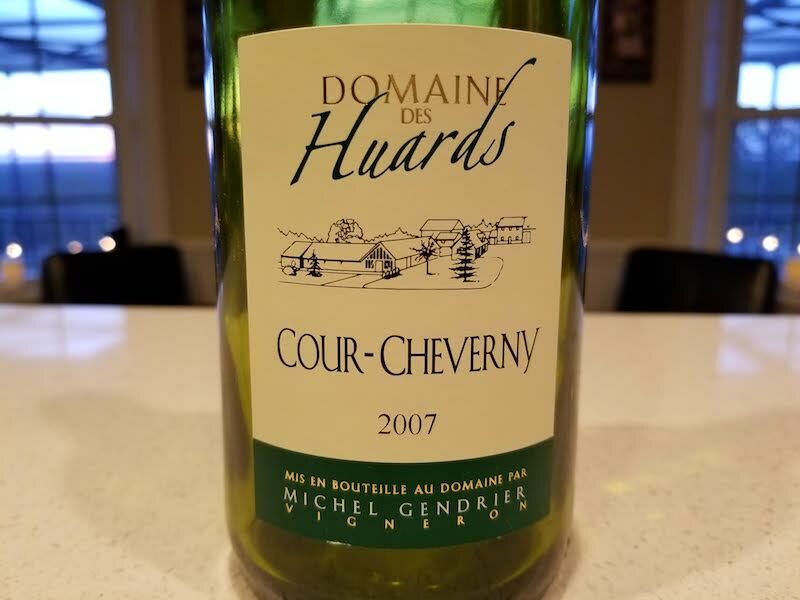 Back in June of 2012, I wrote a blog about the 2007 Domaine des Huards Cour-Cheverny. At the end of that blog entry, I told you that if you had any in your cellar you should drink it up. I was wrong!!!! 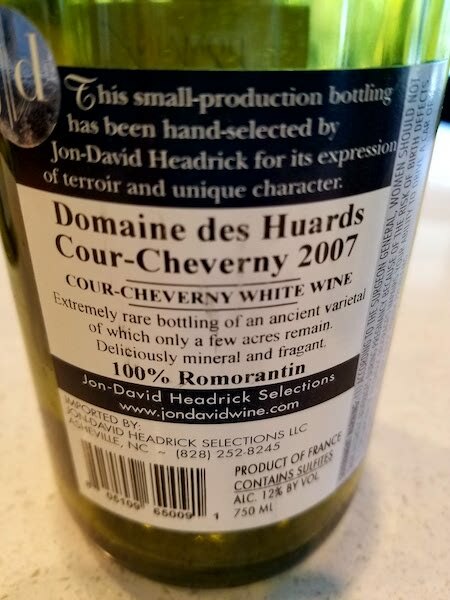 A gal that works for Domaine des Huards sent me an email back in June of ’12, telling me that in fact Romorantin can be aged for 10, 15 and even 20 years without a problem and that it, in fact, gets better with age. I had one more bottle, so I held on to it. Boy, I’m glad I did. I opened it a few nights ago with my husband, and it is drinking beautifully! 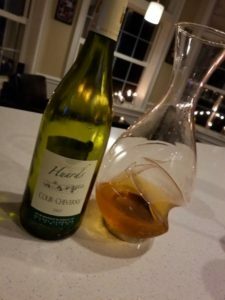 In my initial blog, my tasting notes were pear, mango citrus, and almond on the nose, with some green apple and a bit of mushroom on the palate. Fast-forward five and a half years, I now get melon rind, fresh spring pea, almond, and saline, which tells me that this wine would be a killer pairing with seafood as well as many types of cheese, salads, pasta with cream sauce, vegetarian dishes, and much more. The color is a gorgeous deep golden! I like this wine more now than I did five years ago, and I liked it then too! So what do I wish? I wish I had a few more bottles of this wine in my cellar so that I could try it again in another five years!